Hey guys! 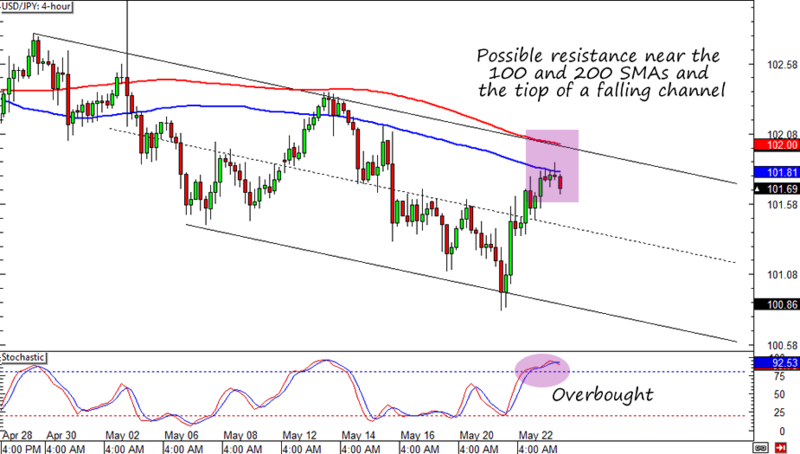 This week I’m looking at this sweet setup on USD/JPY! I’ve been waiting for an opportunity to buy the yen since the BOJ held off from more stimulus. You see, Kuroda and his team not only maintained their current policies, but they also remained upbeat about Japan’s export activity, capital expenditures, and the economy in general. And with the dollar barely reacting to the FOMC meeting minutes and the latest U.S. reports, USD/JPY could move to the tune of the yen’s price action. On the technical side, USD/JPY is currently having trouble breaking above the 102.00 area. In fact, it’s even finding resistance at the 101.80 levels, which is right smack at the 100 SMA resistance on the 4-hour time frame. Not only that, but Stochastic is also sitting at the overbought territory. Do you think this signals a sell for the bears? I’m thinking of selling 0.25% at market and placing another order at the 200 SMA (near 102.00) and a profit target at 101.50. Or I could sell 0.50% now and place the same stop and profit targets for a simpler trade. What do you think? Should I wait for 102.00 or is it okay to short at market? Thanks for any advise!